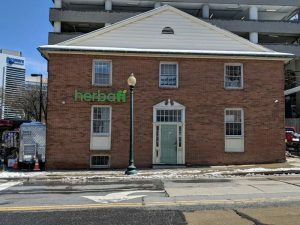 Herbafi, located in Montgomery County, is one of seven additional dispensaries set to open. Maryland’s medical marijuana program had a slow start getting up and running since its creation in 2012, but that’s finally changing. Since December, dispensaries have been building up their inventories and opening across the state. Just this week, Maryland marijuana regulators approved the opening of seven more new medical marijuana dispensaries, including two in Baltimore. These new dispensaries in Baltimore plan to be open and begin serving patients this month. ReLeaf Shop will be opening April 20 at 1114 Cathedral Street in Midtown-Belvedere, and Culta located at 215 Key Highway in Federal Hill, is expected to be up and running within the next two weeks. Five other newly licensed dispensaries opening across the state include RISE-Joppa in Harford County, Rise Bethesda and HerbaFi, both in Montgomery County, Medleaf in Prince George’s County and Dispensary Works in Charles County. Roughly 28,000 patients are currently registered with the Cannabis Commission. These patients can now buy medical marijuana products from nearly 50 licensed dispensaries that are currently open and operating – and that’s only half of the proposed 102 approved by the Maryland Medical Cannabis Commission. With the marijuana business being among the top topics of debate this year, in addition to the increasing progress of dispensary openings, there are exciting new programs also coming to fruition. Lawmakers have recently approved the creation of a “compassionate use fund”, for people who want to use marijuana to alleviate pain but can’t afford it, which will cater to patients on Medicaid or veteran’s benefits. Lawmakers have also approved a bill which will aim to help minorities obtain more ownership roles within the cannabis industry. Despite Maryland’s slow start, it’s clear to see that the states cannabis industry is now in full bloom. If you are interested in finding out if a dispensary will be opening near you or would like more information on the state’s medical marijuana program feel free to give us a call at 410-762-8745.